AUGUSTA, Ga. -- Tiger Woods is many things. He is foremost a golfer, but he's also a son and a father and by pretty much every account of his well-documented career, a genius. I was reminded of that last part of his identity as he struck putts on the practice green situated beyond the 10th tee box before his final round on Sunday at Augusta National. He blinked hard and spoke softly to himself as his Bridgestone balls crested and dove at little white cups inset in these historic grounds. He was talking himself toward major championship No. 15 at a time when the leaders of this tournament should have been pouring coffee and reading the print newspaper (this is Augusta National, after all). Woods, draped in red and black and aged sinew, popped under a graying sky. It did not feel like a Masters Sunday. Woods turned back time, literally in this case, as his first tee shot was in the air off the first hole at 9:21 a.m. local time. Players were going off both tees because an afternoon storm was coming. Little did we know that the only storm we'd see on this day was swinging a TaylorMade driver and wearing a mock-neck red shirt. The starter at the first hole did not announce Woods' name. I suppose at this point when the yoked-up dude in the final pairing is wearing red and black, you just let it go. Everybody already knows. Woods just rolled down the hill and parred the first and the second. He birdied the third as his daughter Sam -- floating in a big contingent of Tiger friends, family and employees -- skipped down toward the rope line to see the putt fall. I don't know if she caught a glimpse, but she certainly knew the outcome. Tiger stalked the fourth tee after his birdie at No. 3. His eyes were on the tops of the towering pines. A genius demanding help from his surroundings. Augusta National chairman Fred Ridley said earlier in the week that some of these trees are nearing their death. A nice parting gift would be some answers for Woods. They didn't succumb, and he came up well short, bogeying the fourth. 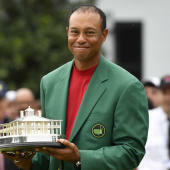 Listen and subscribe to The First Cut with Kyle Porter podcast below for instant analysis on Tiger Woods' historic Masters victory at Augusta National. Tiger made birdies on Nos. 7 and 8 to get to 1 under on the day and scrape the top of the leaderboard at 12 under as playing partner Francesco Molinari plodded on at 13 under. I didn't see the birdie putts on those two holes, partly because patrons were running 10 deep around every green and partly because I chose instead to hear and feel a Tiger Sunday. I've seen plenty of them before; I wanted all the senses activated. That was the poster Nike tells me Rory McIlroy had hanging in his bedroom as a child. Who among us didn't have that poster? As he crouched, Woods' eyes told me that this shot was the axis of his 2019 Masters. How many different scenarios were going through his head at that moment as the leaderboard conglomerated? He later said all he was thinking was par. He hit a tight, dangerous draw toward the water off of that ridiculous lie. Tiger made an easy birdie on the 13th, but Molinari did the same. After Molinari's double bogey at the 12th, it felt as if they would be in lockstep the rest of the way. Frank the Italian against Frank the Tiger. There wasn't a question who the spectators favored. A Sperry-wearing lad exclaimed at one point, "I hate to admit it, but I'm praying Molinari goes left here." The board read "F. Molinari," which is also what the patrons likely thought. The best shot at Augusta National is the second into No. 15. It's the last moment you have to yourself before descending into a lair of spectators ready to see the tournament turn. As a private jet -- probably Rory McIlroy heading home, I remarked to another media member -- cut through the darkening sky, Tiger pumped a 5-iron to the middle of the green and two-putted for another birdie to push his number to 13 under. There was nowhere to go on the 16th, so we watched from the hill on No. 15 and saw Tiger's ball land deep and just left of the ridge that runs down the middle of that green. I grabbed a colleague by his rain jacket and hollered as the ball trundled for the cup, "Tiger's going to make a one on the 16th on Sunday at the Masters with the lead!" It didn't fall, but it came close enough that it effectively ended the tournament. There is a breathless quality at the 16th. Maybe all par 3s are like that, but the inhalation during a player's practice swings combined with the exhalation when the ball is struck make for the most dramatic shot on the second nine for everyone in contention. All Woods needed was a tap in to move it to 14 under. The jacket was slipping from the field, and everyone knew it. Woods missed the 11-foot birdie putt, but it didn't matter. On the 18th, he hit 3-wood and sheathed it with a flip spin of the club. After Molinari got the "thank you for ejecting" applause on the 18th, Woods finally closed and screamed. The place melted. Like Nicklaus in 1986, a scoreboard operator pumped his arm up and down from 30 feet in the air as if conducting a train. The roar was the loudest I've ever encountered up close at a Masters. As Woods zig-zagged to everyone in his group behind the green, somebody among the thousands started chanting "Ti-ger, Ti-ger, Ti-ger." A cacophony rose, and it lasted a long time. Woods walked toward the scoring building, and he released years of frustrating injuries and futile showings at the majors he desperately craves. He pounded the hands of people he'll never see again and screamed into the Augusta air until his voice was hoarse. It was the modern version of Bobby Jones's 1930 celebration in the streets of New York. Genius, by definition, is an extraordinary intellectual power especially as manifested in creative activity, and it is nearly the only way to explain what has happened over the last 730 days. At the 2017 champions dinner, between bites of Danny Willett's mini cottage pies, Woods gasped that he was toast. Now? The only toast is one raised to the greatest winner in golf history. "It's overwhelming," Woods told the gathered media of his fifth green jacket. "I think just because of what has transpired, and last year I was just very lucky to be playing again. The previous dinner, the champions dinner [in 2017], I was really struggling and missed a couple years of not playing this great tournament." German philosopher Arthur Schopenhauer once wrote: "Talent hits a target that no one else can hit. Genius hits a target no one else can see." Nobody saw this target for Woods. I'm not talking about the one on the 2nd hole or the 9th or the 15th but rather the one beyond the 18th. The one where they hand out -- as Woods apparently calls them -- the "green coats." Who could have seen that coming 12 or 18 or 36 or even 72 months ago? It is a target that didn't even exist. Woods created it out of thin air, and then he hit it. In doing so, Woods set a new record by going 14 years between Masters wins. It's fitting that his first major win since his fourth back surgery came at this incredible course some think is the most ingenious puzzle in the sport. There is a brilliance to unlocking its secrets. There is a genius to doing it five different times with nearly as many different swings. Before that time comes, we all strive to flourish as much as humanly possible -- for ourselves and for those around us. We strive to make memories and deliver something to our parents and to our kids. As I walked around Augusta National, that's what I saw: moms taking their daughters and sons taking their fathers to this magical place. It's easy to spot and even easier to enjoy: kids grinning from ear to ear, parents of parents doing the same. Lifetimes have been lived in the time between his first Masters win and his latest. Tiger's father never got to meet Tiger's kids; now they are joined by two iconic moments in one timeless place.